Here are the locations and contact information for CUNY’s mathematics departments. See also CUNY’s Colleges page and map for general campus information. 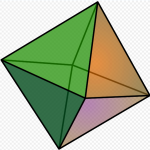 The 8-faced octahedron is one of the five Platonic solids.